Premier Auto Trade has announced the launch of the new MVP Fuel Injector range, suitable for over 2.3 million common Australian and New Zealand vehicles. The new Motor Vehicle Parts (MVP) fuel injectors are a brand new high quality aftermarket product, not second hand, used, or reconditioned units. The initial MVP fuel injector range includes 35 common part numbers, with new parts constantly under development. Current vehicle coverage includes Commodore, Falcon, Laser, Magna, Lancer, Camry, Hilux, Landcruiser, 323, Saab, Grand Vitara, Wrangler, Cherokee, Golf, Bora, Navara and many more. “With the new MVP injector range vehicle owners and technicians have the reassurance that they have a brand new fuel injector, not a reconditioned or second hand product” said Colin Smith, Product Development Manager at Premier Auto Trade. “Modern manufacturing facilities and processes mean a brand new high quality product can be made for a nominal price difference to reconditioning pre used injectors. When you fit parts from Premier Auto Trade you can expect a product designed and tested to the vehicle manufacturer’s specifications offering OE form, fit and function.” he said. For resellers and retailers there is great time and cost savings as there is no core exchange required. This saves time and handling, as well as eliminating the freight costs involved in the core return process. 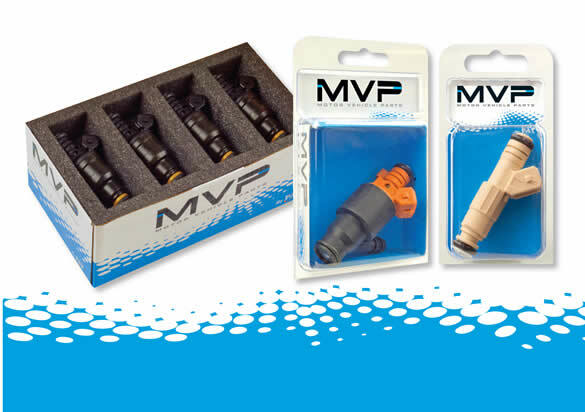 The MVP Fuel Injector range comes conveniently packaged in individual clam shells to allow easy identification while 4, 6 and 8 injector vehicle sets are packaged in a box with a protective foam insert to eliminate transit damage. The MVP range of fuel Injectors come with a full 12 month warranty backed by Premier Auto Trade.